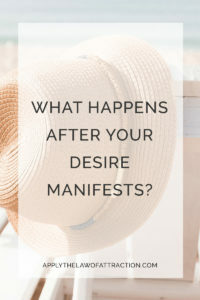 Home » How to Manifest » What Happens After Your Desire is Fulfilled? We all want our desires fulfilled. It's the whole point of learning how to master the Law of Attraction, right? But did you know that what happens after your desire is fulfilled is the key to Law of Attraction success? To manifest your desires, you need to let go and let the Universe be in charge. You also want to imagine how things will turn out every day. When you follow this process, things will resolve exactly as you imagined they would. Why? The secret lies in your imagination. When you imagine how things will turn out, you focus on what happens after your desire is fulfilled. The Law of Attraction isn't about whether what you imagine is real or not, it's about putting energy into what you WANT to create. So when you think about events as if they've already happened, they have no choice but to happen. For example, let's say you want to go to Tahiti. If you spend your time imagining saving money for the trip and researching plane tickets, you're only going to create saving money and researching plane tickets. You're focusing too much on how things will happen and what needs to occur. Instead, you want to focus on the end result. What was your experience in Tahiti? What foods did you eat? What was it like to lie on the beach? What wonderful stories do you have to tell your friends and family? Your imagined scene should be an assumption of your desire fulfilled. You really want to use all of your senses and emotions to imagine what happens after your desire is fulfilled. Are you in a cafe relaxing as you sip a nice cool drink and see people walking by? Are you jumping up and down in joy as you see the cascading waters of the Fautaua Waterfall because you're so happy you don't even notice the water gushing down on you? Of course, your imagined scene is the only thing you want to think or feel about your desire until it manifests. Whenever you have some time during the day, close your eyes and go through your imagined scene. Make sure you do this whenever you have any doubts or negative feelings about your desire. You want to immediately replace the doubts and negativity with what you WANT to happen. Imagine the scene over and over again until it feels completely real, as if you're remembering an event that already happened. One day, something will click and you'll know it'll happen. This is the ultimate sign that your desire will manifest. Here is an excerpt from The Power of Unlimited Imagination by Neville Goddard and Margaret Ruth Broome that nicely explains more about imagining what happens after your desire is fulfilled. It's well worth the read. Let me now define the technique I want you to employ. Consciousness is the one and only reality. Therefore, you must form the object of your desire out of your own consciousness. People have the tendency of slighting the importance of simple things. The idea of creating a state akin to sleep in order to aid an assumption is so simple it can be slighted, but it is very important. Scripture gives us this simple formula for changing the future. The first thing you must do is define your objective. Then construct an event which you believe would happen after your desire was fulfilled. Place yourself in the center of this action, knowing you are the predominant one. Now, immobilize your physical body and induce a state akin to sleep. Mentally feel yourself right into the proposed action by imagining it is taking place here and now. You must participate in the imaginary action, not merely stand back and look on. It is important to feel you are there so that the imaginary sensation is real to you. Always remember that the proposed action implies fulfillment. For example, suppose you desired a promotion in your office. Then being congratulated would be an event you would encounter following the promotion. Selecting this action as the one you want to experience in your imagination, immobilize your physical body and induce a drowsy state – one in which you can control the direction of your thoughts. In this state you can be attentive without effort. Then visualize a friend standing before you. Put your imaginary hand in his. Feel it to be solid and real and carry on an imaginary conversation with him in harmony with the feeling of having been promoted. Never visualize yourself at a distant point in time and space. Make your action take place here and now! The difference between feeling yourself act here and now and visualizing yourself in action as though on a movie screen, is the difference between success and failure. For example, visualize yourself climbing a ladder. Now, with your eyes closed, imagine the ladder is right in front of you and feel yourself climb it. Experience has taught me to restrict the imaginary action to a single act and to re-enact it over and over again until its reality is felt. If the act is too long and involved, your attention will wander. Hosts of associated images will present themselves for your attention and lead you hundreds of miles away from your objective in space, and years away in point of time. If, climbing a particular flight of stairs would be the likely event which would follow the fulfillment of your desire, then restrict your action to climbing those stairs. Should your attention wander, bring it back to its task. Keep on climbing those stairs until they have all the solidity and distinctness of reality. The idea must be maintained without any sensible effort on your part. You must, with the minimum of effort, permeate the mind with the feeling of the wish fulfilled. Drowsiness facilitates change because it favours attention without effort. But it must not be pushed to the state of sleep, for then you are no longer able to control your movements. The most effective way to embody a desire is to assume the feeling of the wish fulfilled and then, in a relaxed and drowsy state, repeat a short phrase over and over again like a lullaby. Say, “Thank you, thank you, thank you,” as though you were addressing a higher power, thanking him for giving you your desire. You need do nothing on the outside to bring your wish to fulfillment. All you need do is apply this technique of prayer. With your eyes closed and your physical body immobilized, induce a state akin to sleep and enter into the action as though you were an actor on the stage. Experience in your imagination what you would experience in the flesh were you now in possession of your objective. Make elsewhere here and then now. Do that and the greater you, using a larger focus, will call forth the means which will produce the desire you have assumed. You are relieved of all responsibility to make your desire a reality because, as you imagine and feel it is so, your dimensionally larger self determines the means. Do not think someone is going to have to be injured or disappointed in order to make your dreams come true. Imagination has ways you know not of, so do not be concerned about the other. Now, close your eyes and allow yourself to become lost in contemplation. Feel you are what you want to be so completely that you are no longer conscious of the fact that you are in this room. Do this and you will receive a shock when you open your eyes to discover you are not that which you felt you were only a moment before, or knew you possessed. Now let us go into the deep. I need not remind you that you are now that which you have assumed you are. Do not discuss this with anyone, not even yourself. You cannot take thought as to the how, when you know you already are! Your three-dimensional, limited reasoning mind should not be brought into your drama. It does not know that what you just felt is true. Let no man tell you that you should not have your desire. What you feel that you have, you will have. And I promise you this much, after you have realized your objective, upon reflection you will have to admit that your conscious, reasoning mind could never have devised its expression. Knowing you are and have that which you have appropriated, do not discuss it with anyone. Do not look elsewhere for encouragement, simply go about your Father's business, doing everything normally and naturally and let your appropriated desires come into your world. your help….i want to know..about the timings when to let go?? money how many days do i need to visulise and when to let go?? Do we need to visualuse aftr let go to??? Plz help me out?? Hi Elizabeth, I broke up with the man I hoped to marry because he was unable to see himself getting married at this moment. We have been apart for 10 weeks now and currently we are not talking. He is furious with me and flares up at me when I contact him. We had a deep connection and I don’t want to lose that. So I am willing to wait for him to be ready to marry. I hope to be reconciled to him and I’m not sure if I should be visualizing a reconciliation or a wedding. Can u please advice?